Comments: Buy with confidence. Excellent Customer Service & Return policy. Ships Fast. 24*7 Customer Service. Ask the provider about this item. Most renters respond to questions in 48 hours or less. The response will be emailed to you. 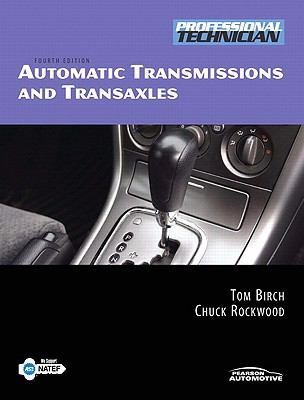 Rockwood, Chuck is the author of 'Automatic Transmissions and Transaxles', published 2009 under ISBN 9780135051351 and ISBN 0135051355. Loading marketplace prices 6 copies from $18.56 How does the rental process work? With our dedicated customer support team, 30-day no-questions-asked return policy, and our price match guarantee, you can rest easy knowing that we're doing everything we can to save you time, money, and stress. Pages are clean and are not marked by notes, highlighting or fold. Pages are clean and are not marked by notes, highlighting or folds. Pages are intact and may have minimal notes and/or highlighting or folds. All pages and the cover is intact. The spine may show signs of wear. Pages include notes and/or highlighting. All pages and the cover is intact. Pages include considerable notes in pen or highlighter, but the text is not obscured. Choose between standard or expedited shipping to make sure that your textbooks arrive in time for class. When your books are due, just pack them up and ship them back. And don't worry about shipping - it's absolutely free! Need to return a rental?